Similar catches and then a beauty bumps ino me in the kitchen! And I mean a moth and not my wife! The catches are been a little measly the last two nights I ran the trap (Thursday 7 moths and Friday 8 moths) but has kept me going and at least it hasn't ground to a total halt. Early Greys seem to be at their peak here with 7 seen over two days. 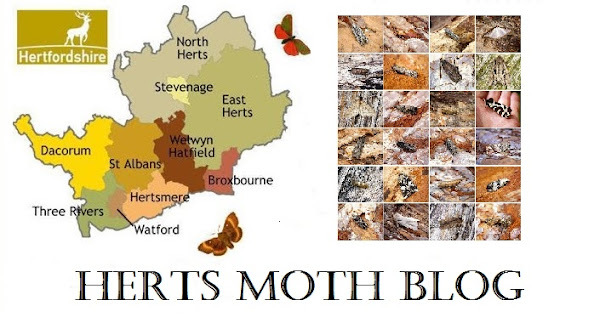 Last night the Herts Moth group went out in search of the Northern Drab at it's only known Hertfordshire site near Royston at Therfield Heath, the target species was caught as an individual but nevertheless is enough to prove that it still resides there, great job guys and girls who managed to brave the cold night we had last night...a frost this morning it was that nippy! Planning other trips this week to see if we can find it at other chalky sites in the County. Back to the beauty and I thought a fly had bumped into me as I made my way into the kitchen to make my breakfast, the presumed fly headed straight for the window and it looked rather moth-like. Potted up it was a year-first Esperia sulphurella, I intially thought it was a garden first, but I did catch one last year according to my records. Nevertheless it was a pretty cracking looking specimen. It must have flown in yesterday when we had the french door open. + 2x Early Greys to works security light at Popis Garden - Ware.